Where do Ann Arbor's bars fit among the Top 50 in Michigan? Posted on Sat, Mar 10, 2012 : 5:56 a.m.
Four strip clubs, two major sports venues, one country club and one Big Old Building with many concepts under one roof — along with two Ann Arbor establishments — can be found on Michigan's Top 20 list of bars, based on liquor purchases in 2011. Extend the list to the Top 50 in Michigan, and two more Ann Arbor bars join the crowd. Good Time Charleys, a University of Michigan campus favorite and one of the top 10 bars in Michigan. This peek at Michigan's Top 50 follows an article in AnnArbor.com from mid-February that listed the Top 15 in Washtenaw County. In that article, officials said statewide wholesale liquor sales went up 3.66 percent in 2011, along with a 1.64 percent increase in price per case. Gross sales were $270 million, generating revenue of $61.5 million, up $4.3 million. 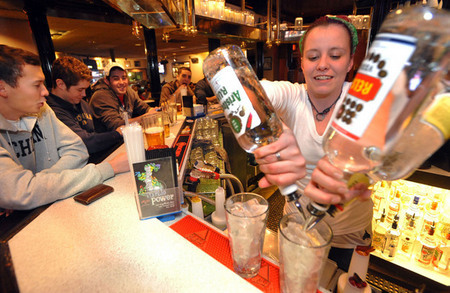 The total sales included $43.4 million from establishments with on-premise licenses, a $1.5 million increase over 2010. Ann Arbor was part of that growth, with liquor sales in the county growing 7 percent. But where does that leave our establishments in a statewide profile? One bar from Ann Arbor, Good Time Charleys, made the top 10. Necto came in at No. 15. A bit further down the list is Knight's Bar and Restaurant at 36, then Blue Leprechaun at No. 38. Good Time Charleys bought $285,908 in wholesale liquor from the state, later selling it to customers "by the pour." While a record showing in Washtenaw County, it's still a ways behind the No. 1 entry: The B.O.B. in Grand Rapids, which spent $596,538. Just like with the Washtenaw County list, this one doesn't show the retail sales totals - and it doesn't include beer or wine. But it's also a gauge of one major element of this sector's business. Curious about the full list? You can read it here. Sun, Mar 11, 2012 : 2:22 p.m.
do REAL drinkers,as opposed to sippers care about Atmosphere? Sat, Mar 10, 2012 : 8:08 p.m.
A better title might have been, &quot;Who sell the most liquor in Michigan&quot;? I think the most interesting part of the story is that retail liquor sales are up 7% in Ann Arbor this year. That's a sure sign that the recession is fading. Sun, Mar 11, 2012 : 2:24 p.m.
that could be though be because package liquor sales are bigger than ever. Sat, Mar 10, 2012 : 11:21 p.m.
An Arbor isn't just a college town, it is now a &quot;young urban professional&quot; town and they are probably single, have money and they socialize by drinking. Ypsi is what Ann Arbor used to be like. Too bad. Sat, Mar 10, 2012 : 8:56 p.m.
Not necessarily - people usually drink more during economic downturns, though not always at bars, which are costly ways to drink. College towns don't always mirror trends in non-college towns either. Students are notorious drunks. Sat, Mar 10, 2012 : 7:07 p.m. I am amazed how some things just spawn multiple articles. The Road Commission, the U of M problems and Bars and drinking come to mind. This article borders on pushing drugs, i.e. booze. Sat, Mar 10, 2012 : 3:46 p.m.
Necto? Blecch! Bring back Second Chance!! Sat, Mar 10, 2012 : 2:51 p.m. Sat, Mar 10, 2012 : 1:49 p.m.
What a worthless way to rank anything! It's like saying the U of M has the #1 football team in the country because they have the most people in the stands every week! I don't even drink and I know if you polled all the drinkers in Michigan, Joe Louis would not make the &quot;top&quot; 200. Sun, Mar 11, 2012 : 4:05 a.m.
Casinos are for gambling, johnny. Sat, Mar 10, 2012 : 7:41 p.m.
How else would you rank them if you are the STATE of Michigan, which is using this as a revenue source. it also accurately displays who is purchasing the most since everyone pays the same price from the state for the same items. It may be skewed when one bar sells more Grey Goose over 5 oclock vodka, but it tells you which bars are providing the most revenue for the state. The only surprise I have, is that the casinos are not on the list. Sat, Mar 10, 2012 : 1:45 p.m. Sat, Mar 10, 2012 : 12:42 p.m. So the criteria is how much booze you can sell, rather than atmosphere, clientele, friendliness of servers, or anything else? Not really an attraction I would think. Sun, Mar 11, 2012 : 8:42 p.m.
johnnya2 Really? The servers at Comerica Park and Joe Louis could give the patrons a shot with a taser and it would not keep them from going back for more! Sun, Mar 11, 2012 : 5:04 a.m. The servers at the Penthouse Club are VERY friendly! Sat, Mar 10, 2012 : 11:42 p.m.
Geez Johnny show some respect to the lady. Elaine I agree completely though I consider this a story with an bad headline. It should have included &quot;top selling,&quot; which would make it more journalistic. Sat, Mar 10, 2012 : 7:35 p.m.